Into everyone’s life, some rain must fall. Some people fret when it rains. They perceive it as a disruption to their normal flow. Such people become deterred from engaging in activities that might otherwise bring opportunities and/or advantages to their endeavors. Through their incumbered mind, they become less mobile. Others dance between the raindrops. They go about their activities with an enhanced sense of purpose. Which one are you? In this case, raindrops are a metaphor for the unexpected occurrences that happen in life, those occurrences that we’d not planned for or had little anticipation of their imminent appearance. The way you deal with such situations will determine the level of happiness you experience, your perception of how successful you are, and the stability of your mental state of mind. The point is, raindrops will occur in everyone’s life. It’s the way they perceive such situations that will determine how they interact with those situations. Thus, if you want to achieve more in life, if you want more out of life, if you want to control more of what occurs in your life, learn to dance between the raindrops (i.e. view things from a positive versus negative perspective) … and everything will be right with the world. Raindrops (i.e. unanticipated/unplanned occurrences) occur in most negotiations of substance. If you’re not mentally prepared to address them, you can find yourself digging deeper into a hole of despair into which the waters of despair will populate. That will make the situation worse for you because you’ll start to feel besieged by what may seem to be a barrage of overwhelming activities that you can’t or don’t want to recover from. Obviously, that will put you at a disadvantage in the negotiation. When you feel the barrage of offers/counteroffers begin to overwhelm you, stop the rain; get out of the environment or find something to buffer your perception. Here’s what you should remember. You can stop the rain by changing your perception of what’s occurring. That will be the start of what’s really occurring (i.e. your reality is what you perceive it to be). Once you do that, you’ll be able to view what’s occurring from a perspective that’s not so debilitating. Psychologically, that will also allow the endorphins to flow that will give you a mental uptick. That will lead to you becoming a more formidable negotiator. 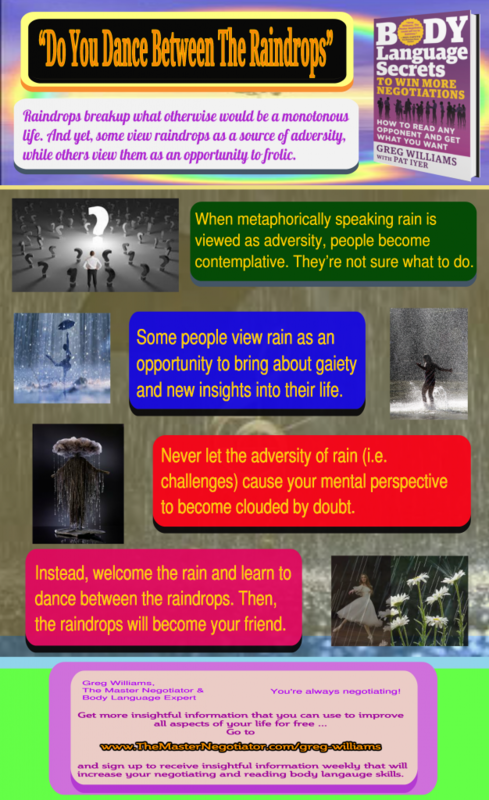 The post “Do You Dance Between The Raindrops” – Sunday Negotiation Insight appeared first on The Master Negotiator & Body Language Expert.